This is the striking new cover for a reissue of The Holy Machine which will be available from early December from Corvus. Corvus hope, as I do, that it will draw the attention of people who enjoyed Dark Eden, but haven’t yet come across this, my first novel. There’s more information about the book here, and some thoughts on its history here. 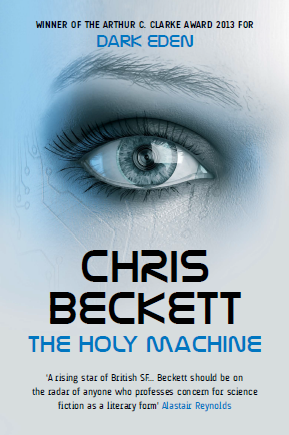 As well as paperback and ebook, The Holy Machine is also available as an audiobook, narrated by John Banks.